Halloween is finally upon us! A holiday that I know many bookworms enjoy; especially if you are like me and enjoy Stephen King or any gothic/horror-inspired works of fiction! 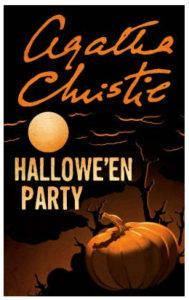 I have been reading Agatha Christie’s, Hallowe’en Party, to help celebrate All Hallow’s Eve. This is Hercule Poirot #36 – so, closer to the end of the 40 book series. It was originally published in November 1969. I love Christie’s writing. I find her books relaxing and comforting. The standard mystery format, the who-dunnit, that has been replicated so many times feels so genuine in her grasp. Personally, I enjoy Miss Marple a little more, as I love her character and obviously, can relate a bit more to her. In this book, a murder takes place at a children’s Halloween party, the victim herself a 13-year old girl. I found the age of the victim a bit surprising; to my recollection, I cannot recall if someone so young had ever been the victim in a Christie story before. I am hoping to finish this by the end of the week! A series similar to this is Jane Haddam’s, Gregor Demarkian series. Repeatedly in the series, Haddam refers to her protagonist as the Armenian-American Hercule Poirot and indeed, I do believe he was greatly inspired by Christie’s work. Haddam’s mysteries, although written decades later, stay true to the format and feel of Christie’s work although the stories aren’t quite at the same level in my opinion. They seem a little more forced and vary as far as quality the series over. One thing I do love about this series though is that the majority of them are ‘holiday’ mysteries. I just love mysteries set around holidays! I’m not sure why, I have just always been a sucker for them! What are some holiday mystery books that you could recommend? I am always looking for more! I received an early copy of this book from St. Martin’s Press so I ended up actually finishing it on the release day. The Beautiful Ones surprised me with the smoothness of the text. I had never read anything by this author, Silvia Moreno-Garcia, but I will definitely read other books of hers now. There was a lot more romance in the story than I would typically seek out in a novel (I am far from a ‘romantic’) but it is subtle and romantic in a way that even I could relate to and enjoy. While I was reading, I kept thinking of how much it reminded me of a more modern version of William Makepeace Thackeray’s, Vanity Fair, but with magic! The atmosphere was thick with old world upper class traditions (most notably, gossip!) and excesses; easily transporting the reader to the streets and parties of Loisail (the city where the majority of the action takes place). The main characters were quirky and full of vices; spewing forth with inner desires. It is told from the perspective of multiple characters and moves along at a steady pace; although it may be considered a slow burn, taking a while for the action to truly heat up. 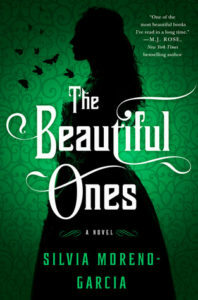 There is plenty of beauty and angst in this novel to keep one entertained and I would certainly recommend it to friends who enjoy novels of love, envy and magic.